I’m afraid this is rather late as I’ve been seriously ill in hospital again and had to postpone the August session at Ditchling Museum. 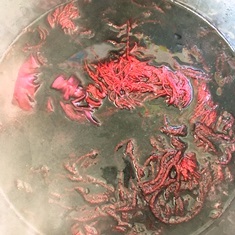 The colour from weld was extracted in the usual way, simmering it for about 30 minutes. 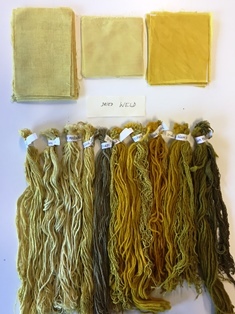 When the dye liquid had been strained off and the fibres added, the temperature of the dye bath was kept just below simmering point to achieve clearer colours. We used both dried weld and fresh weld for comparison purposes. 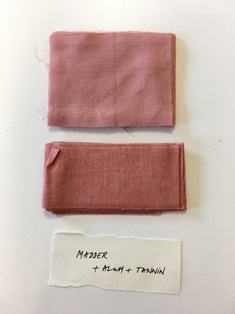 The colour was extracted from the cochineal using the multiple extraction method described on p59 of Colours from Nature. 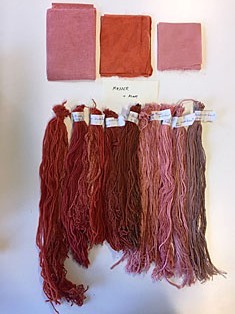 For this method the same whole (or ground) cochineal is simmered three times and the extracted colour is strained and added to the dye bath after each extraction. The solutions from the three extractions form the dye bath. It is a good idea to strain the final solution through a coffee filter paper to remove any loose particles which might cause blotches on the fibres but we didn’t do this as we didn’t have the necessary equipment. 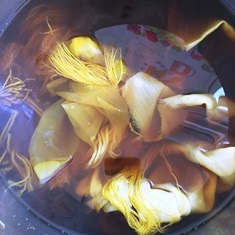 The fibres were added to the dye bath and simmered for 30 to 45 minutes. The chopped madder root was used according to the following recipe: first wash the madder in a sieve under running water for a few seconds. Then pour boiling water over it, leave it to soak for about 30 seconds and then strain off this liquid and put it aside for a second dye bath later. Repeat this process and add the strained-off liquid to the first liquid. Then put the same madder root into a pot and simmer it for about 30 minutes to extract the dye colour. 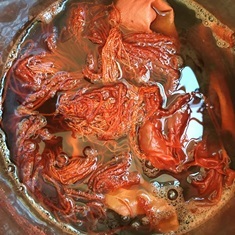 Strain off this liquid which becomes the first dye bath. 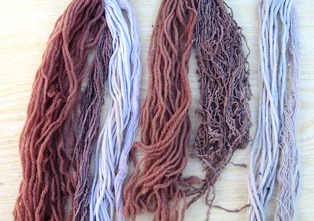 Allow it to cool a little, then add the fibres and leave them to steep in the dye bath for about 45 minutes. If a deeper colour is required, the dye bath can be heated for 30 to 45 minutes but keep the temperature below simmering point. Then allow the fibres to cool in the dye bath. 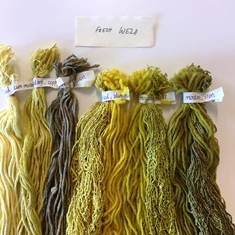 The solutions from the first two soakings give a second dye bath, which can be used either cool or heated as above. However, I’m afraid we produced no samples from this second dye bath as it was discarded in error. 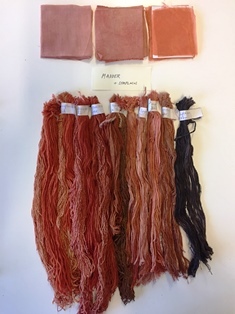 This method of dyeing with madder differs from some other methods but usually gives clear corals and reds, depending on the strength of the dye bath and the length of time the fibres are in it. 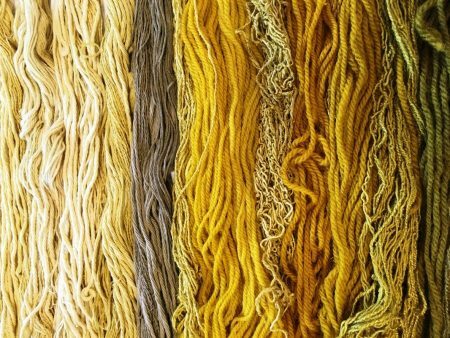 For really deep colours, it is often necessary to use 200% madder to dry weight of fibres, especially if dyeing vegetable fibres. 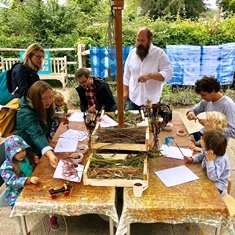 Unfortunately I’ve been seriously ill in hospital again, so the August session at Ditchling Museum was cancelled and we used the September session to harvest and use the woad and Japanese indigo (Persicaria tinctoria) before it was too late in the season. At this session we also used Saxon Blue. 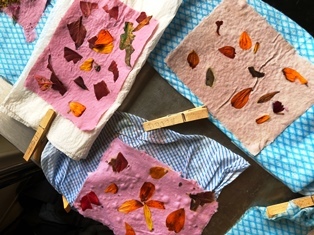 After we had used the woad and Japanese indigo leaves for blue, we simmered the same leaves to make a dye bath for tans. 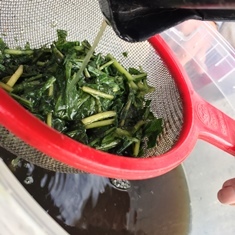 One of the students brought some woad leaves, which were chopped and then we poured boiling water over them and left them to steep for about an hour. 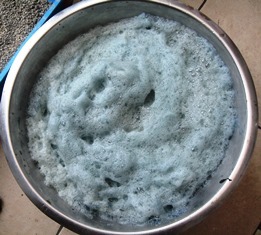 Then the liquid was then strained off and the leaves squeezed well to extract all the dye potential.When the liquid had cooled to 50C, soda ash was added to turn the liquid from brown to green and the liquid was whisked until the froth became blue and then whisked further until it started to turn white again. We allowed the froth to subside and then added a reducing agent, sodium hydrosulphite, to remove the oxygen. When the liquid below the surface had become greeny yellow, the vat was ready to use. NOTE: As woad is said to prefer soft water, it is a good idea to use rain water for woad vats. However, I rarely remember this and have always found the ordinary water from my tap produces a perfectly good woad vat. I have also read that the dye solution should be cooled quickly to 50C, so some people put the container of woad solution into a second container of cold water and sometimes add ice cubes to speed up the cooling process. This is not something I tend to do and my woad vats are always fine but they might be even better if I remembered to cool them down quickly. My Japanese indigo had already started to form seed, so the blue dye potential was reduced and the results were rather disappointing. 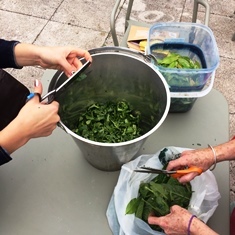 Luckily, one of the students brought some of her own Japanese indigo leaves and we tried two methods – the usual vat method and the water and vinegar method. 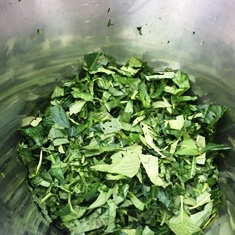 In the vat method the Japanese indigo leaves are torn or cut up into small pieces, covered with cool to warm water and brought to simmering point over a period of about 1 to 2 hours. 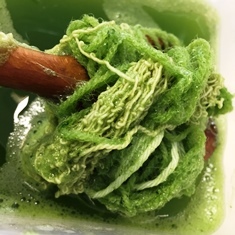 (Note that this differs from the woad method in that boiling water is not poured over the leaves, but they are first covered with cool to warm water and then heated gradually.) The leaves are then left to steep in the hot water for about an hour. Then the liquid is strained off and the leaves are squeezed well to extract all the dye potential. 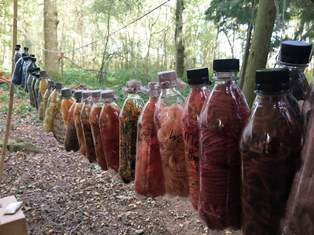 When the liquid has cooled to 50C, the dye vat is then made in the same way as described above for woad. 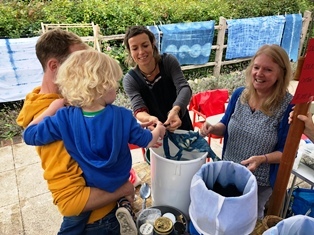 The water and vinegar method requires at least 200% fresh leaves and this method gives blues which may be less stable or permanent that the blues from the more traditional methods of dyeing with woad/indigo. However, this method requires only water and clear 5% vinegar. The vinegar should be added at the rate of about 15mls clear vinegar per litre of water. Harvest the leaves and process them immediately. 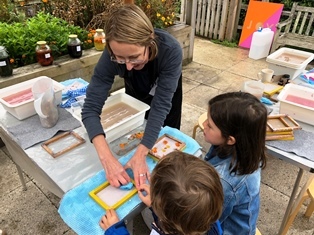 Chop or cut up the leaves as finely as possible, preferably not using a wooden chopping board, as this may absorb too much of the precious dye solution, or process them with a little water in a liquidiser. Put the chopped leaves into a container and add enough water to cover them. Then add the vinegar and knead the leaves very well for at least 5 minutes until the liquid is bright green. Strain off the liquid and set it aside. Knead the leaves again in water and vinegar as before, strain off this liquid and add it to the liquid reserved from the first kneading process. Immerse the fibres immediately in the liquid and leave them to soak for about one hour. Then rinse them in clear water and air them. Finally, add a small amount of fibres to the liquid and leave them overnight to exhaust any remaining dye potential, then rinse and air them. NOTE: I have read that some dyers use iced water without the addition of vinegar but I have not tried this. Saxon blue or sulphonated indigo is an indigo extract made by dissolving indigo powder in sulphuric acid. The process was discovered around 1740. It is called Saxon Blue because the blues it produced resembled the blues of ceramic wares based on cobalt and Saxony was the centre of that industry. 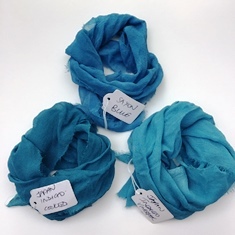 Saxon Blue is used mainly for dyeing wool and silk and produces blues with a turquoise tone. Blues from Saxon Blue may be less fast to light and washing than indigo blues made by the vat method and deep blues from Saxon Blue have higher levels of fastness than paler shades. There is some disagreement about whether an alum mordant is needed for Saxon Blue. I tend to prefer to use an alum mordant, as this seems to produce deeper, clearer blues. Saxon Blue is simple to use. Prepare the hot water for the dye bath and then just stir in some Saxon Blue liquid. 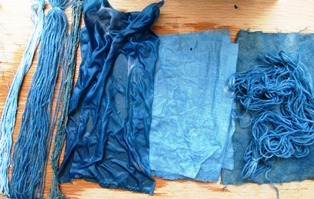 How much one needs to use depends on the depth of blue required and the amount of fibre being dyed. I usually start with one or two teaspoons and then add more if necessary. Then add the fibres, bring the dye liquid up to simmering point and simmer gently for 30 to 45 minutes. Then leave to cool before rinsing. The Saxon Blue we used was bought from Fiery Felts (see link under Useful Websites) and made by Helen Melvin. This gives excellent blues and a little goes a long way. 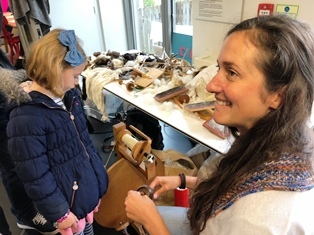 As I’ve recently been seriously ill in hospital again, I had to postpone the last Ditchling Museum natural dyeing course session but I was sufficiently recovered to be part of the museum’s open day on September 22nd. 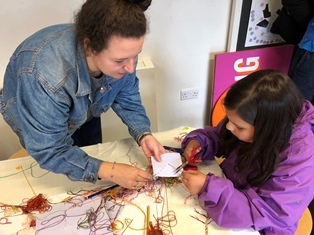 This was to celebrate the 5th anniversary of the opening of the new museum buildings and the museum offered free entry all day, with a variety of activities, a barbecue and live music. 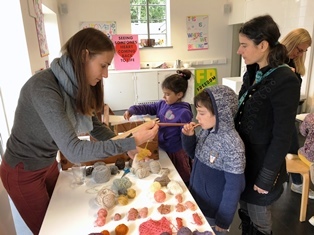 Unfortunately the weather was rather cold and rainy in the afternoon but the activities offered by some of my dyeing course students proved very popular, even those that took place outside. 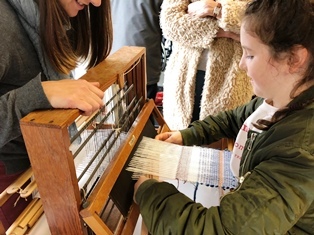 Among the activities on offer were handspinning, weaving, stitching, paper making, mark making with botanical inks and handmade brushes and the opportunity to use an indigo vat. We set up the indigo vat using natural indigo, soda ash and sodium hydrosulphite, with a stock solution on hand to top up the vat when necessary. 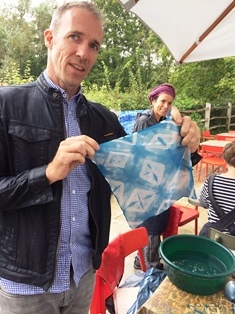 We also offered a chance to learn some shibori techniques and the results brought smiles of delight to all those who participated. 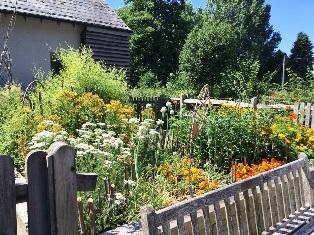 The museum’s dye garden was not as spectacular as it had been earlier in the Summer but it was still flourishing and we had a display of solar dye pots using plants from the dye garden. 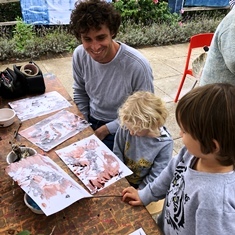 The indigo vat in use. 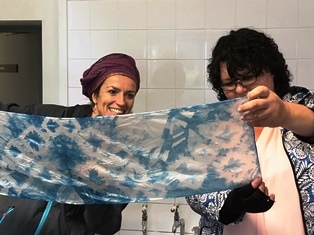 Zuzana Krskova and Jackie Sweet help unwrap a shibori-dyed tote bag, as it comes out of the post-dyeing clear water dip. Below are some results from the indigo vat.